Lake Charles, LA is a wonderful destination in a beautiful southern state, and this Ultimate Guide To Mardi Gras is just what you need to make sure you have an epic experience to remember! The second largest Mardi Gras celebration in Louisiana happens in Lake Charles, located in the southwest corner of the state. 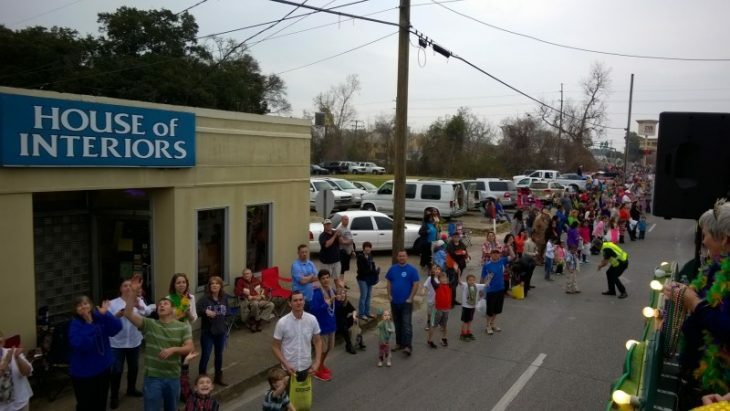 The family-friendly environment brings an estimated 140,000 people together to enjoy music, food, parades, fabulous costumes, carnival rides, zydeco dancing, gumbo cookoff and a children’s day, complete with their own parade. To get the most out of your Mardi Gras experience here is a quick and easy guide to Mardi Gras in Lake Charles, LA. Mardi Gras kicks off on January 6th with 12th Night. Twelfth Night, which is twelve days after Christmas, is the traditional beginning of the Mardi Gras season prior to Lent. Lake Charles, LA has many different events around Mardi Gras, but they vary year to year. 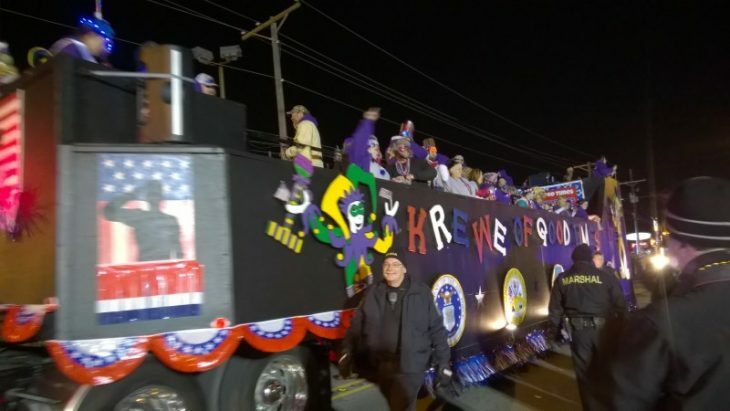 From music and food to annual parades, this guide to Mardi Gras will help you decide what to do during Mardi Gras and Lake Charles and how to make your experience amazing. Book Hotel Early (ie: NOW): Don’t wait to book your hotel room. Rooms fill quickly and if you don’t want to be disappointed I recommend making the hotel reservation now. Know the Parade Route: Check the parade websites (linked above), grab a map and note the parade route. Pay attention to where may be the best place to see the parade. I recommend towards the beginning of the route while everyone is fresh and ready to party. Parking: This is where knowing the parade route will help. Park near the route, but be sure to follow the parking rules. The last thing you’ll want is a parking ticket at the end of the festive day. Also note that when the parade is over there will be a lot of traffic leaving the area so plan accordingly. Check the weather: I made the mistake of not checking the weather before flying to Lake Charles for Mardi Gras. Needless to say I wish I would have brought a heavier coat and gloves. Yes, Louisiana can cool right off so you’ll want to be prepared. Go Early/Don’t Be Late: To get a great spot you may want to arrive early and find a great spot along the route. Arrive late and all the spots, especially parking, may be gone. “Throw Me Something Mister”: Practice the phrase “Throw me something mister” and yell it loudly and proudly during the parade. As beads, doubloons, cups and other Mardi Gras treasures are tossed your way do your best to catch them. Be sure to take a tote bag to the parade to hold your throws. If something lands on the ground, place your foot on it and pick it up after the float has passed. Please DO NOT run into the street to grab swag. There are many, many floats and lots of beads and swag to be had, remember to stay safe. Wear the Colors: Get in the spirit of the season and wear the traditional colors of Mardi Gras, purple, gold and green, to the parades. Bring snacks/water: A Mardi Gras parade experience can last a few hours. Be sure to pack snacks and water to stay hydrated and keep from getting hangry. Mardi Gras Museum: Largest display of Mardi Gras costumes in the world. 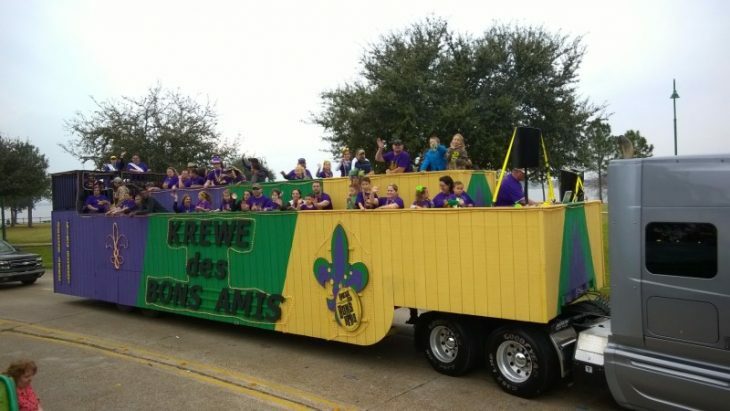 See costumes, history of King Cakes, Mardi Gras in Southwest Louisiana, and climb aboard a float! Iowa Chicken Run: Held on February 9th, this is a traditional Mardi Gras experience. “The parade goes west on Hwy 90 stopping at local businesses and continues going through neighborhoods with the horses following behind. 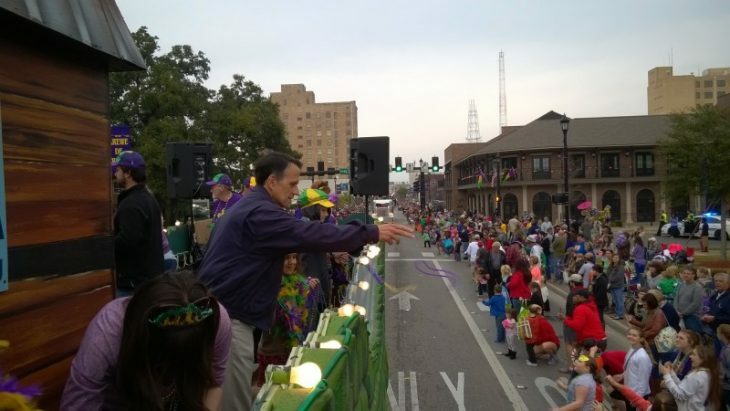 The captain blows his whistle at participating homes for the crews to get down and dance to zydeco music, which is played with an accordion and scrub board. 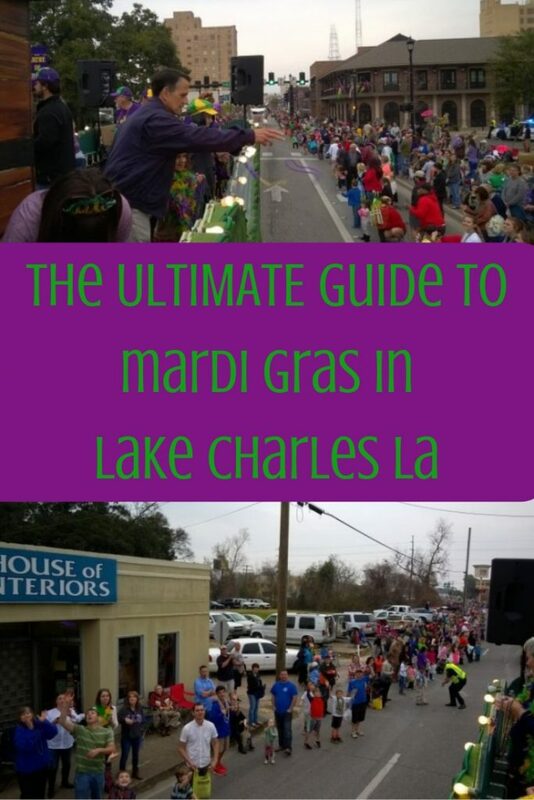 I hope this guide to Mardi Gras in Lake Charles, LA helps you to enjoy this fun holiday celebration, even more, this year! I’ve never been there before, looks like a lot of fun, and this is the first time of heard of this event. WOW!